A formerly-widespread species which underwent a catastrophic decline through the 20th century and was last seen in the wild in 1988 at Dungeness, before being declared extinct in the UK in 2000. A reintroduction project began at Dungeness in 2011 using queens from Sweden and workers have been seen in several successive years at the time of writing. The species is very variable, with a white to buff-coloured tail and a yellow-black-yellow thorax (although the second band is sometimes lost in females). Males generally have two buff-coloured bands on the abdomen though the extent of these varies from virtually non-existent to covering almost the entire abdomen. Queens and workers generally have a broad first yellow abdominal band and a narrower second band, though the extent of each of these varies. Males with extensive yellow on the abdomen resemble the Field cuckoo bumblebee (Bombus campestris), distinguished by the short face of the cuckoo as opposed to the long face of the Short-haired bumblebee, and the Great yellow bumblebee (Bombus distinguendus), which lives hundreds of miles away from the reintroduction site and never has black hairs on the abdomen (these are always present in the Short-haired bumblebee, though a microscope may be required in particularly yellow individuals). Queens and workers can look similar to the Ruderal bumblebee (Bombus ruderatus) but the second abdominal yellow band is usually distinctive. 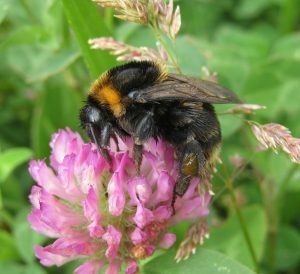 If in doubt, the ventral surface of the sixth abdominal sternite should be checked for the presence of a central longitudinal keel, present in the Short-haired bumblebee but not in Ruderal or Garden bumblebees.